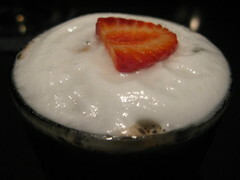 Last Tango in Modena: Hendricks Gin, muddled strawberries, 3-year-old balsamic vinegar topped with St. Germain foam. I’d say the margarita and this cocktail tied for the number-one favorite. I love the innovativeness of this and how he turned one of my favorite desserts into an impressive cocktail. It even looks like dessert in a glass. I kinda wish it wasn’t served over a big block of ice though because I wanted more of it to drink! Perhaps a smaller cube for me?